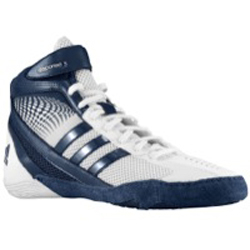 The adidas Response 3.1 is a lightweight wrestling boot designed for massive take-downs in a match-winning fit. Upper has a three-layer spacer construction allowing for optimal ClimaCoolÂ® ventilation. 3-StripesÂ® design on side of shoe works as an overlay to offer lightweight support. adiWEARâ„¢ outsole offers great traction so you can attack and defend easier on the mat. Combined with RadialCurve, you get a great balance of grip and spin. Internal die-cut midsole assists the perfect attack stance.